Metrics firm Gartner has released some exciting news for fans of Google's open source OS. The momentum that has behind Android ever since the launch of the Motorola DROID has continued to lift the OS to the point where it is expected to be the world's second largest mobile platform by the end of this year. The Symbian platform currently wears the crown. At the end of last year, Android had a market share of only 3.9% which put it behind Symbian's controlling 46.9%, RIM's 19.9%, the 14.4% belonging to iOS and Windows Mobile 8.7%. 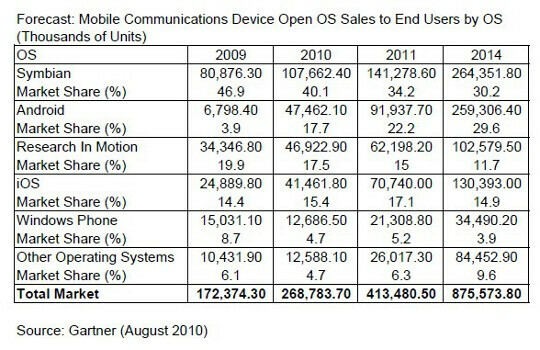 But 2010 has belonged to the green robot and by the end of the year, Gartner expects Android's piece of the pie to rise to 17.7% which will leap frog third place RIM (17.5%), iOS (15.4%) and Windows Mobile (4.7%). Symbian's share is predicted to drop to 40.1% as the ball drops on Times Square. Over the next two years, Gartner forecasts more sliding for Symbian, to a 30.2% slice by the end of 2014. Android should be a breath behind with 29.6% of the market. Interestingly, the company predicts a rather slower pace of growth for Apple with iOS owning 14.9% of the pie which is enough to pass a rapidly declining RIM, but not enough to challenge Symbian or Android. RIM's total should be slightly above 11% by the end of 2014. It's an amazing story how Android has really taken hold of the consciousness of the cellphone market. Going from worse to first is an inspirational lesson, as fans of the Tampa Bay Rays learned a few years ago. If Gartner has read the tea leaves correctly, the open source OS has some more years of amazing growth ahead of it. This article is probably a little off, and by that I mean that Android will grow faster than what they have projected. Much faster. watch. FTW!!! iOS will die faster than they predicted also. Your fist sentence was already ok. Then your last sentence killed it. That's what hate does. It kills. Yes, Android will eventually knock out Symbian (before 2014), and Symbian will lose more and more as the years go by when more and more people would try out Android devices and realize how outdated Symbian is compared to Android. As for IOS, the way it's going for Apple, whether you like Apple or hate it, it's going to remain strong. The iphone is a niche product, and a very good one as well, that could compete and easily outsell any of its direct competition in its category. It has successfully done so in the past 4 years, and will continue to do so. Android will have a higher market share, while Apple will have a higher market value. These predictions are off. They are not taking into account Nokia's revamping with Symbian^3 and then Symbian^4, which will be very different. Take all this into account, and we could well be looking at Symbian growing marketshare instead of loosing it. Time will tell, but I believe Symbian will have a higher marketshare with all of the new things going on with it. I am not doubting that Android will grow to the number 2 spot, but Symbians lead will be more than predicted.